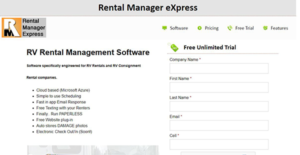 What is Rental Manager eXpress? Rental Manager eXpress is a feature-rich rental management platform designed primarily for RV (Recreational Vehicle) rentals and RV consignments rental businesses. The solution leverages the latest technology with an Outlook-inspired user interface featuring multiple floatable, dock-able panels. It’s a powerful software that is available as a Software as a Service (SaaS), licensed source code, or an on-premises solution. Rental Manager eXpress is a robust solution for RV consignment companies and RV rentals operating in single or multiple locations. The software boasts a number of features that streamline the operations of multiple rental locations. One of these features is the integrated email processing system which is designed to auto-assign emails to customers, vehicle, agreement, employee, or the RV owner. The email automation eliminates the need to manage a location or company email box thanks to its ability to automatically download, open, read, and assign emails. It sends customized replies to customers with vital details such as rental plans, rental estimates, and cancelation policies. The software provides an easy-to-use, yet powerful vehicle scheduling module. The suite comes with features that make it easy to obtain availability and pricing estimates for RV vehicles together with the preliminary rental agreements. The system simplifies the collection of renter’s requirements, the point of contact, and trip information while enabling operators to process a high volume of phone calls in a fractional time. Better still, RV rentals can easily create and monitor innumerous estimates during one phone call and auto-generate upcoming tasks or reminders when sending emails. Another noteworthy feature is the built-in WYSIWYG report designer. This is an important feature that enables RV rental businesses to run and save detailed reports to multiple file formats. It empowers operators to group reports to be emailed or printed, import Triad state insurance records as embedded attachments, or auto-create nightly pre-selected reports and hoard them in the secure cloud. If you are considering Rental Manager eXpress it might also be a good idea to examine other subcategories of Best Car Rental Software listed in our base of SaaS software reviews. Every organization has different wants and needs a software that can be customized for their size, kind of employees and buyers, and the particular industry they are in. For these reasons, no system can offer perfect functionality out-of-the-box. When you try to find a software system, first be sure what you want it for. Read some Rental Manager eXpress reviews and ask yourself do you desire basic functionality or do you need complex tools? Are there any industry-specific tools that you are searching for? Obtain the answers to these queries to help your search. There are multiple factors that you need to mull over and these include your finances, particular business needs, your organization size, integration requirements etc. Take your time, check out a few free trials, and finally zero in on the system that provides all that you require to improve your firm effectiveness and productivity. How Much Does Rental Manager eXpress Cost? We realize that when you make a decision to buy Car Rental Software it’s important not only to see how experts evaluate it in their reviews, but also to find out if the real people and companies that buy it are actually satisfied with the product. That’s why we’ve created our behavior-based Customer Satisfaction Algorithm™ that gathers customer reviews, comments and Rental Manager eXpress reviews across a wide range of social media sites. The data is then presented in an easy to digest form showing how many people had positive and negative experience with Rental Manager eXpress. With that information at hand you should be equipped to make an informed buying decision that you won’t regret. What are Rental Manager eXpress pricing details? What integrations are available for Rental Manager eXpress?